Paul Jackson says he will attempt to break his Guernsey 24-hour time-trial record again next year. 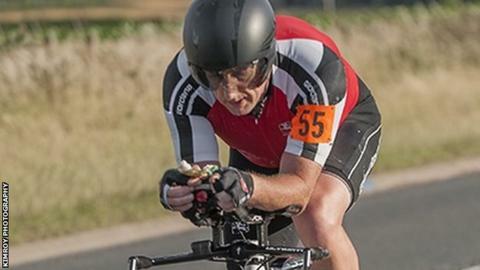 The 48-year-old rode 477.48 miles at the national championships, beating the old mark by more than 26 miles, as he became British veterans champion. "On Sunday afternoon I swore to everybody that I would never ever do one again," he told BBC Radio Guernsey. "But there's a lot of things we could improve on, so I think I'm probably going to have another crack next year." It was the second time he had ridden over an entire day, having broken the island record when he rode 451 miles in last year's national championships. "I was aiming for 480 miles this year, I didn't quite do that, but I'm still very pleased with what I did," he added. "You get some very dark moments during the course of a ride. "When I finished, I got off the bike, laid on the floor and just burst into tears with the emotion of the whole thing."